If you are looking for a white flowering rose with a difference, then Rugosa alba could be worth a look. Large single white flowers with a strong fragrance are an attraction from spring through summer. In addition the foliage is very attractive, a deep olive green with texture as well. Once the flowers have faded you have the added attraction of beautiful red hips which last well into winter. 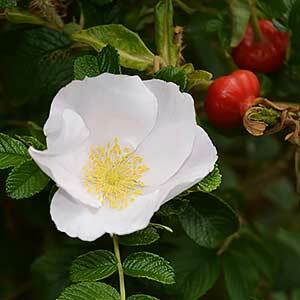 Rose hips are used to make teas, jams and jellies, and Rugosa alba produces some of the best. This is a repeat flowering rose, vigorous growth habit and an excellent alternative to many of the modern white roses. It has been in cultivation for nearly 200 years, and is very popular in all types of garden designs. Rugosa alba can be used as a shrub in the garden border, or perhaps mass planted as low hedge. It can be planted as a specimen plant in a container and will grow well in a sunny courtyard. It also attracts bees and other beneficial insects to the garden.